Elevate your Foreign Corrupt Practices Act knowledge and practical skills at the FCPA Institute. The FCPA Institute is coming to Washington, D.C. on September 19-20. The FCPA Institute is different from other FCPA conferences as information is presented in an integrated and cohesive manner by an expert instructor with FCPA practice and teaching experience. Moreover, the FCPA Institute promotes actual engagement and active learning by participants through issue-spotting videos, skills exercises, small-group discussions, and the sharing of real-world practices and experiences. To best facilitate the unique learning experience that the FCPA Institute represents, attendance at each FCPA Institute is capped at 30 participants. In short, the FCPA Institute is offered as a refreshing and cost-effective alternative to a typical FCPA conference and is designed to elevate the FCPA learning experience for a diverse group of professionals such as in-house and outside counsel; other compliance professionals; finance, accounting, and auditing professionals; business executives and others seeking sophisticated FCPA knowledge and practical skills. This link contains more information about the FCPA Institute (including a sampling of what prior FCPA Institute “graduates” have said about their experience). 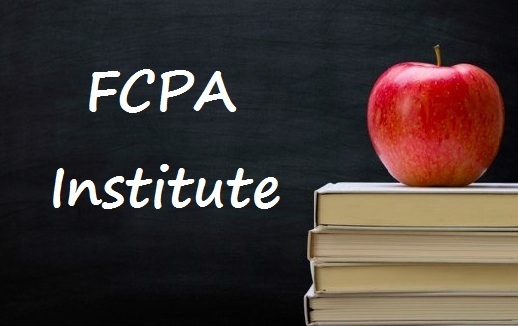 At the end of the FCPA Institute, participants can elect to have their knowledge assessed and can earn a certificate of completion upon passing a written assessment tool. In this way, successful completion of the FCPA Institute represents a value-added credential for professional development. The FCPA Institute – DC has been approved for 12 CLE credits in Virginia and attorneys seeking CLE in other states will receive a Uniform Certificate of Attendance that can be used for attorney self-submission in other states. In addition, previous FCPA Institute participants have successfully obtained continuing education units from the Society of Corporate Compliance and Ethics for attending the FCPA Institute. To register for the FCPA Institute – DC, click here.